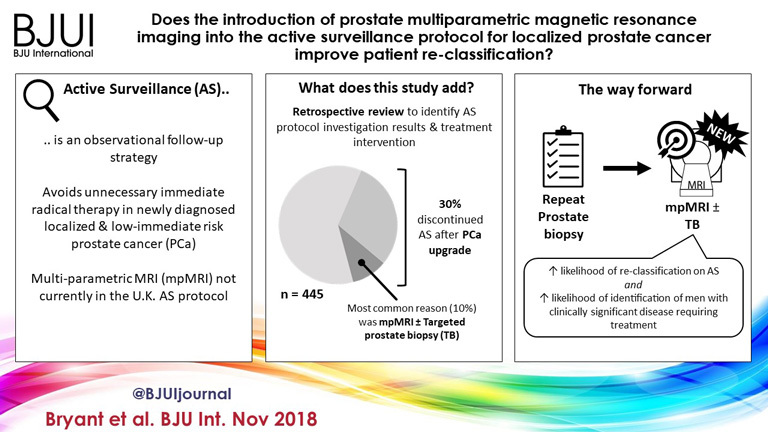 Does the introduction of prostate multiparametric magnetic resonance imaging into the active surveillance protocol for localized prostate cancer improve patient re-classification? To determine whether replacement of protocol‐driven repeat prostate biopsy (PB) with multiparametric magnetic resonance imaging (mpMRI) ± repeat targeted prostate biopsy (TB) when evaluating men on active surveillance (AS) for low‐volume, low‐ to intermediate‐risk prostate cancer (PCa) altered the likelihood of or time to treatment, or reduced the number of repeat biopsies required to trigger treatment. A total of 445 patients underwent AS in the period 2010–2016 at our institution, with a median (interquartile range [IQR]) follow‐up of 2.4 (1.2–3.7) years. Up to 2014, patients followed a ‘pre‐2014’ AS protocol, which incorporated PB, and subsequently, according to the 2014 National Institute for Health and Care Excellence (NICE) guidelines, patients followed a ‘2014–present’ AS protocol that included mpMRI. We identified four groups of patients within the cohort: ‘no mpMRI and no PB’; ‘PB alone’; ‘mpMRI ± TB’; and ‘PB and mpMRI ± TB’. Kaplan–Meier plots and log‐rank tests were used to compare groups. Table 2 Detailed outline of the ‘pre-2014’ and ‘2014–present’ Oxford active surveillance protocols. Of 445 patients, 132 (30%) discontinued AS and underwent treatment intervention, with a median (IQR) time to treatment of 1.55 (0.71–2.4) years. The commonest trigger for treatment was PCa upgrading after mpMRI and TB (43/132 patients, 29%). No significant difference was observed in the time at which patients receiving a PB alone or receiving mpMRI ± TB discontinued AS to undergo treatment (median 1.9 vs 1.33 years; P = 0.747). Considering only those patients who underwent repeat biopsy, a greater proportion of patients receiving TB after mpMRI discontinued AS compared with those receiving PB alone (29/66 [44%] vs 32/87 [37%]; P = 0.003). On average, a single set of repeat biopsies was needed to trigger treatment regardless of whether this was a PB or TB. Replacing a systematic PB with mpMRI ±TB as part of an AS protocol increased the likelihood of re‐classifying patients on AS and identifying men with clinically significant disease requiring treatment. mpMRI ±TB as part of AS thereby represents a significant advance in the oncological safety of the AS protocol. Dear Sir, This work  was deservedly highlighted as Paper of the Week for its potential impact on clinical practice. Meanwhile, it caught our attention that the authors – as many before them - use the term "significant prostate cancer" throughout their paper. We feel that this issue needs to be addressed and discussed further. As most prostate cancers have an indolent course, the term “significant prostate cancer” must be reserved for cancers, which are potentially lethal . From earlier studies, we know that this group of cancers are characterized by high tumor stages, high Gleason scores, and a high percentage of tumor involvement on biopsies. However, this knowledge is based on systematic prostate biopsies. Thus, findings on mpMRI targeted biopsies, including increase in Gleason grade group, number of positive cores, and maximum cancer core length, cannot readily be translated to the clinical setting of earlier times. Tumor grade and volume of the disease may simply be upgraded even with no change in the underlying cancers. Nevertheless, this is usually how such findings are used and the focus is mainly on moving patients from AS to active treatment. The potential problems of this approach are illustrated in the results of Bryant et al., as 30% of the patient cohort is taken out of the AS program after a median time of only 1.55 years with mpMRI based findings as the most common cause. In previous publications, men have been able to stay on AS for considerably longer with limited consequences on metastasis free survival . The issue is further highlighted by results from the ProtecT trial in which there was a median of about 4 years before 30% of the active monitoring group had gone on to active treatment, without this causing a significant increase in either overall survival or disease specific survival . In addition, data from prostate cancer cohorts not treated with curative intent show us that even men with localized intermediate risk prostate cancer have a low risk of dying from prostate cancer . Seen in this context, it is plausible that some cancers are falsely classified as "significant" cancers as a result of mpMRI. Indeed, Bryant and colleagues illustrate that men undergoing mpMRI have an increased risk of discontinuing AS which may result in increased over-treatment. The issue is further exacerbated by the tendency to treat increasingly older patients even though a survival benefit from active treatment is questionable in this group. There is no doubt that mpMRI may provide important and valuable information and it is a massive leap forward that we might be able to identify occult high-grade cancers early. However, this new tool must be used with consideration and respect for the gaps in our knowledge. In that context, it is likely that current indications for AS can be expanded to include more favorable intermediate risk cancers when the diagnosis is made based on mpMRI targeted biopsies combined with systematic biopsies. 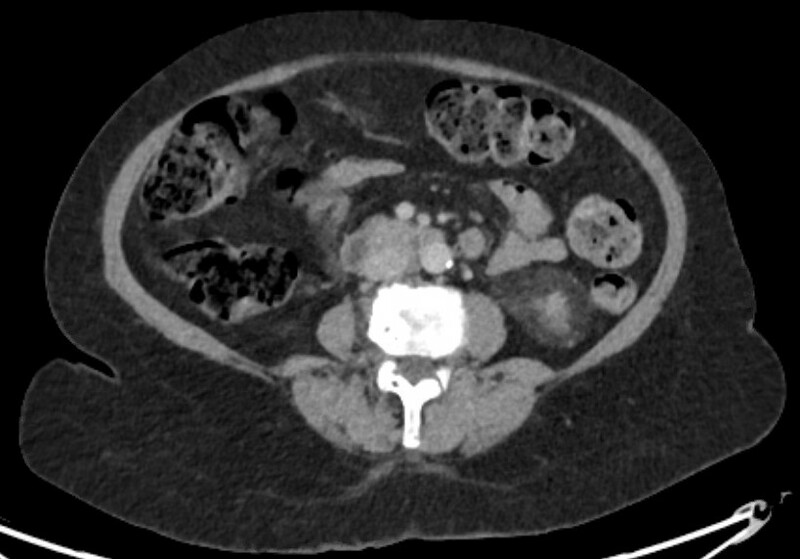 In addition, mpMRI should be utilized to reduce the proportion of patients who opt for active treatment due to anxiety or the burden of multiple sets of systematic biopsies. Exploring these issues are crucial because staying on AS is not just about safely avoiding surgery or radiotherapy. Rather it is about avoiding or postponing highly prevalent and clinically significant functional side effects with considerable implications for quality of life. Thus, we want to underline that the use of mpMRI should not only be used to exclude patients from AS protocols but also in future protocols to include men in such programs. Mikkel Fode MD, PhD, FECSM*, Kasper Drimer Berg MD, PhD†**, Peter Busch Østergren* MD, PhD *Department of Urology, Herlev and Gentofte Hospital, Herlev, Denmark, †Department of Urology, Regional Hospital West Jutland, Holstebro, Denmark, **Copenhagen Prostate Cancer Center, Department of Urology, Rigshospitalet, University of Copenhagen, Copenhagen, Denmark. References 1.Bryant RJ, Yang B, Philippou Y, Lam K, Obiakor M, Ayers J, et al. Does the introduction of prostate multiparametric magnetic resonance imaging into the active surveillance protocol for localized prostate cancer improve patient re-classification? BJU Int. ; 2018;122(5):794–800. 2.Popiolek M, Rider JR, Andren O, Andersson S-O, Holmberg L, Adami H-O, et al. Natural history of early, localized prostate cancer: a final report from three decades of follow-up. Eur Urol. ; 2013;63(3):428–35. 3.Bokhorst LP, Valdagni R, Rannikko A, Kakehi Y, Pickles T, Bangma CH, et al. A Decade of Active Surveillance in the PRIAS Study: An Update and Evaluation of the Criteria Used to Recommend a Switch to Active Treatment. Eur Urol. ; 2016;70(6):954–60. 4.Hamdy FC, Donovan JL, Lane JA, Mason M, Metcalfe C, Holding P, et al. 10-Year Outcomes after Monitoring, Surgery, or Radiotherapy for Localized Prostate Cancer. N Engl J Med. ; 2016;375(15):1415–24. 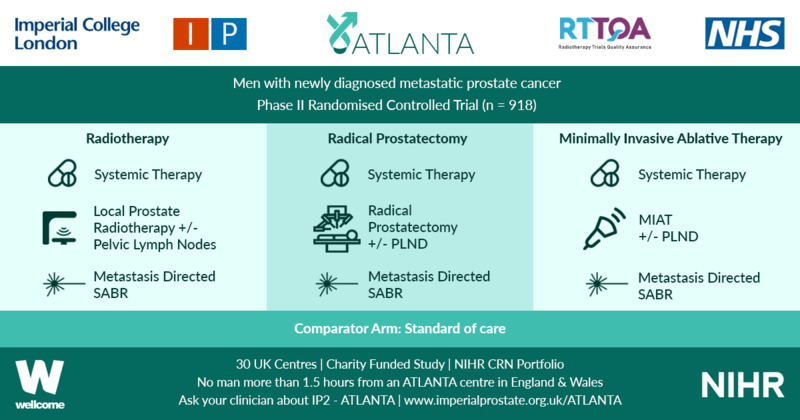 5.Rider JR, Sandin F, Andren O, Wiklund P, Hugosson J, Stattin P. Long-term outcomes among noncuratively treated men according to prostate cancer risk category in a nationwide, population-based study. Eur Urol. ; 2013;63(1):88–96. We thank Dr Fode and colleagues for their correspondence regarding our recently published manuscript . We wish to clarify some of the issues and comments they highlight. Regarding the term “significant prostate cancer”, we agree that this definition should be reserved for cancers that are potentially lethal. Historically, and currently, in the context of Active Surveillance (AS), these cancers are characterised by a higher tumour stage, increased number of positive biopsy cores and/or longer cancer length, and higher Gleason grade group compared to baseline findings, in the absence of routine clinical use of any potential molecular determinants of a lethal phenotype. The clinical question addressed in our recent manuscript was whether introducing multi-parametric magnetic resonance imaging (mpMRI) into our AS protocol for localised prostate cancer improved patient re-classification. We did not define “significant prostate cancer”, but rather focused on the drivers for men to abandon AS and receive active treatment. We agree that the use of this imaging adjunct may therefore lead to disease upgrading, even without a biological change in the underlying cancer per se, and hence our use of the term “re-classification”, rather than disease “progression”. The results of the targeted (plus systematic) biopsy following the initial undertaking of mpMRI during AS likely accounts for much of the 30% of our cohort receiving radical treatment after a median time of 1.55 years, as our protocol had been to undertake that first mpMRI around one year after starting AS. The reported cohort of AS patients had not received a baseline pre-biopsy mpMRI, as this practice was introduced at our institution in 2016 , after these men had started AS. Hence, it is likely that the timing of men leaving AS to receive treatment was triggered by the first mpMRI as a follow-up measure and subsequent repeat targeted biopsies, rather than true biological disease progression. The use of indiscriminate repeat biopsies at pre-specified and arbitrary intervals during any AS protocol (as practiced historically before the availability of mpMRI) is likely to have driven men towards active treatment unnecessarily, and added to potential adverse effects of repeat biopsies on functional outcomes after radical prostatectomy . With regards to the ProtecT study , men in the non-intervention arm received Active Monitoring (AM), rather than intensive AS. In ProtecT, men on AM did not receive regular imaging by mpMRI, nor did they receive repeat biopsies unless triggered by a suspicion of disease progression. This is very different from contemporary AS protocols. It is therefore inappropriate to draw parallels between AM in ProtecT and contemporary AS. We agree that benefits of mpMRI in AS programs may be to reduce the proportion of patients who opt for active treatment due to anxiety, as well as decreasing the burden of multiple sets of unnecessary systematic biopsies. The true definition of “clinically significant” prostate cancer is subject to much controversy, and many prostate cancers are classified inappropriately as “significant”. This depends on complex biological and molecular features of aggressive and lethal disease – yet to be defined by ongoing research - as well as competing co-morbidity. We agree entirely with Fode and colleagues that many men with localised intermediate-risk prostate cancer have a relatively low risk of dying from prostate cancer. This underpins the recommendation from the UK National Institute for Health and Care Excellence (NICE) that patients with low-volume low- and intermediate-risk localised prostate cancer may consider AS as a viable management option, re-iterated in its recently updated guidelines under consultation [5,6,7]. Richard J. Bryant*† , Prasanna Sooriakumaran†**, Freddie C. Hamdy*† and Simon F. Brewster* *Department of Urology, Oxford University Hospitals NHS Foundation Trust, Oxford, UK, †Nuffield Department of Surgical Sciences, University of Oxford, Oxford, UK, and **Department of Uro-Oncology, University College London Hospital NHS Foundation Trust, London, UK References 1.Bryant RJ, Yang B, Philippou Y, Lam K, Obiakor M, Ayers J, et al. Does the introduction of prostate multiparametric magnetic resonance imaging into the active surveillance protocol for localized prostate cancer improve patient re-classification? BJU Int. ; 2018;122(5):794–800. 2.Bryant RJ, Hobbs CP, Eyre KS, Davies LC, Sullivan ME, Shields W, et al. Comparison of prostate biopsy with or without pre-biopsy multi-parametric MRI in prostate cancer detection: an observational cohort study. J Urol. 2018. [Epub ahead of print] 3.Sooriakumaran P, Calaway A, Sagalovich D, Roy S, Srivastava A, Joneja J, et al. The impact of multiple biopsies on outcomes of nerve-sparing robotic-assisted radical prostatectomy. Int J Impot Res. 2012;24(4):161-4. 4.Hamdy FC, Donovan JL, Lane JA, Mason M, Metcalfe C, Holding P, et al. 10-Year Outcomes after Monitoring, Surgery, or Radiotherapy for Localized Prostate Cancer. N Engl J Med. ; 2016;375(15):1415–24. 5.National Institute for Health and Care Excellence. Prostate Cancer: Diagnosis and Management (CG175). National Institute for Clinical Excellence; 2014. 6.Graham J, Kirkbride P, Cann K, Hasler E, Prettyjohns M. Prostate cancer: summary of updated NICE guidance. BMJ 2014; 348: f7524 7.https://www.nice.org.uk/guidance/GID-NG10057/documents/evidence-review-7.